Our folders are specifically designed for legal documents and letters of historical importance. The Institute for City History in Frankfurt holds one of Europe‘s most important historical records, with a tradition going back over five centuries. 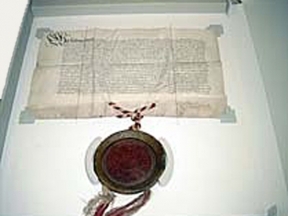 The institute has approximately 750 legal documents of different, often elaborate workmanship. In the 19th century the documents had been stored in boxes, probably custom-made by a single bookbinder. However, they had been packed in boxes that were completely unsuitable. The documents were taken out from the old packaging, the younger, yet still inadequate seal packaging made of board or linen were removed and the contemporary wooden or metal containers were left untouched in their natural condition. 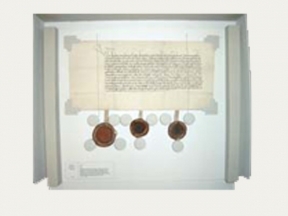 The documents and seals were carefully cleaned and then secured flat on trays made from new protective board material. As a result the seals and their attachment tags were provided a safe housing. With the high-quality and ageing-resistant packaging supplied by KLUG, the basis for appropriate long-term storage of these valuables has been provided.